Las inmunodeficiencias combinadas graves son un grupo de enfermedades que pueden llegar a ser catastróficas. Además de producir infecciones recurrentes, pueden manifestarse en la piel con reacciones morbiliformes, eritrodermia o lesiones granulomatosas, o simular una dermatitis seborreica o una enfermedad de injerto contra huésped. Previamente, se consideraba que las alteraciones autoinmunitarias y las inmunodeficiencias eran condiciones mutuamente excluyentes; sin embargo, en la actualidad se describe una asociación importante entre ambas. Pese a esto, la presentación concomitante de inmunodeficiencia combinada grave y psoriasis no había sido descrita en otros casos clínicos. El objetivo es presentar el caso de un paciente con esta rara asociación. 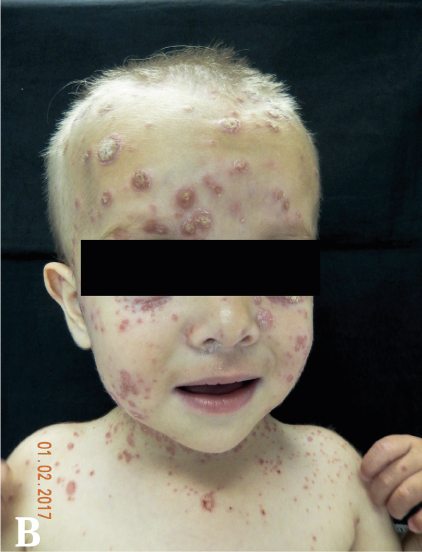 Severe combined immunodeficiency is a group of catastrophic diseases that besides recurrent infections, affect the skin with morbiliform eruptions, granulomatous lesions, seborrheic like dermatitis and as graft versus host disease. Autoimmunity and immunodeficiencies were considered in the past as mutually exclusive conditions. Currently, an important association between both conditions has been described. However, the concomitant presentation of severe combined immunodeficiency and psoriasis has not been described in other clinical cases. The main objective is to present a case with this rare association. 1. Chinn IK, Shearer WT. Severe combined immunodeficiency disorders. Immunol Allergy Clin North Am. 2015;35:671-94. 2. Fischer A, Notarangelo LD, Neven B, Cavazzana M, Puck JM. Severe combined immunodeficiencies and related disorders. Nat Rev Dis Primers. 2015;1:15061. 3. Paller AS. Genetic immunodeficiency diseases. In: Goldsmith LA, Katz SI, Gilchrest BA, Paller AS, Leffell DJ, Wolff K, editors. Fitzpatrick’s Dermatology in General Medicine. Eigth edition. Toronto: McGraw-Hill; 2012. p. 1715-25. 4. Arason GJ, Jorgensen GH, Ludviksson BR. Primary immunodeficiency and autoimmunity: Lessons from human diseases. Scand J Immunol. 2010;71:317-28. 5. Milner JD, Fasth A, Etzioni A. Autoimmunity in severe combined immunodeficiency (SCID): Lessons from patients and experimental models. J Clin Immunol. 2008;28(Suppl.1):S29-33. 6. Denianke KS, Frieden IJ, Cowan MJ, Williams ML, McCalmont TH. 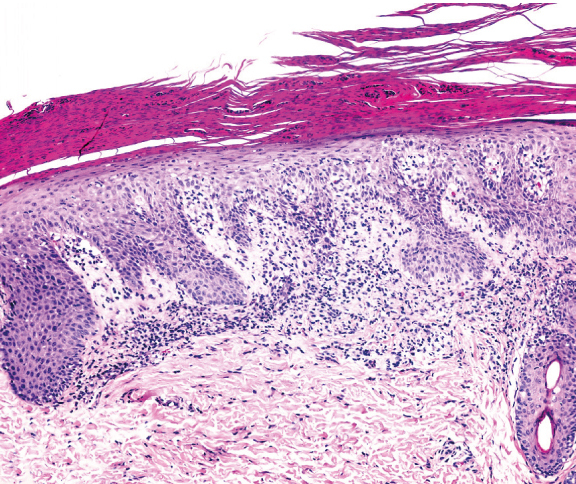 Cutaneous manifestations of maternal engraftment in patients with severe combined immunodeficiency: A clinicopathologic study. Bone MarrowTransplant. 2001;28:227-33. 7. Jang S, Kim IS, Youn SW. Chronic graft-versushost disease mimicking psoriasis in a patient with hemophagocytic lymphohistiocytosis. Ann Dermatol. 2016;28:90-3. 8. Kawakami Y, Oyama N, Nakamura K, Kaneko F, Kikuta A, Suzuki H. Psoriasiform eruption associated with graft-versus-host disease. Acta DermVenereol. 2007;87:436-8. 9. Li X, Li J, Wang L, Niu X, Hou R, Liu R, et al. Transmission of psoriasis by allogeneic bone marrow transplantation and blood transfusion. Blood Cancer J. 2015;5:e288. 10. Dogra S, Mahajan R. Psoriasis: Epidemiology, clinical features, co-morbidities, and clinical scoring. Indian Dermatol Online J. 2016;7:471-80. 12. Tollefson MM. 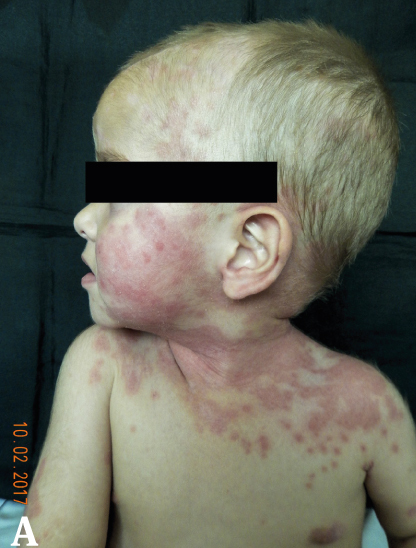 Diagnosis and management of psoriasis in children. Pediatr Clin North Am. 2014;61:261-77. 13. Benoit S, Hamm H. Childhood psoriasis. Clin Dermatol. 2007;25:555-62. 14. Bronckers IM, Paller AS, van Geel MJ, van de Kerkhof PC, Seyger MM. Psoriasis in children and adolescents: Diagnosis, management and comorbidities. Paediatr Drugs. 2015;17:373-84.